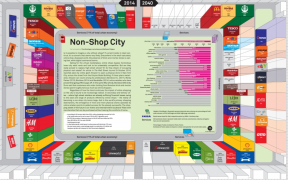 Is it possible to imagine a city without shops? If current trends in retail continue, it’s a scenario that seems very likely. Everywhere in the retail-saturated, online shop-obsessed world, the presence of brick-and-mortar stores is waning fast, while digital commerce booms. Opting for the virtual marketplace, online shops bypass horrendous inner-city retail rents and look to be unbeatably competitive. But are they really poised to replace high-street stores? Or do they dream of occupying physical real estate? An article in The Wall Street Journal (9 October 2014) reported plans by online giant Amazon to open a physical store in New York City, across the street from the Empire State Building. If those plans materialize, Amazon can count among its predecessors Bonobos Inc. (2011), Warby Parker (2013), Birchbox (2014) and BaubleBar (2014): online retailers who have proved that going offline pays off. In the same WSJ article, Bonobos CEO Andy Dunn said that customers who order clothing from Bonobos brick-and-mortar stores spend roughly twice as much as online shoppers.